My clock was given to me by my mother. 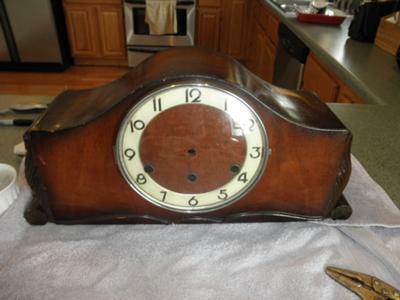 Her mother in the 1930's bought this clock at Sears in Ontario Canada. On the clock plate, on the backside it has an ingraved stamp on the clock face, with FHS at the top underneath. The clock circle are numbers as follows: 15cm/178,28. It is also stamped Made in Germany. There is no label that I can see. But on the underside outside, it is stamped with the number 850 with an oval stamp the has the letters I think, P1B1S. There appears to be a name but the ink stamp had to much ink and it kinda of runs togther. When I received the clock it appears that it may have been wound up too tight. Any ideas what to do... also this is a clock that brings back memories of my Grandfather. I would hear it chime every 15 minutes. The chime would get longer as the hands approached another hour.